For me sweet potato pie is the pie that holiday memories are made of! In my family on both sides – we didn’t eat pumpkin pie for Thanksgiving or Christmas – it was sweet potato pie all the way! In fact I think I was probably in Junior High before I actually ate a piece of pumpkin pie – yep – school cafeteria! I wasn’t impressed and in fact I really didn’t like it at all. I couldn’t understand why there was pumpkin pie everywhere but no sweet potato pie. Well it didn’t take me long to find out that sweet potato pie was something my relatives made and most of the black families in my hometown. It was our pie. All I can say is “yea”! Today sweet potato pie has gone main stream. You can even buy sweet potato pie filling and sweet potato pies already made from some grocery stories and online stores like Amazon! I’m old school and I go the “DIY” route, but if you’re so inclined to buy your pie, be my guest and bon appetit! But if you want to make your pie I’m here for you! If you have a question or concern, just send me an email – I’ll hold your hand and walk you through it! It’s easy as pie! 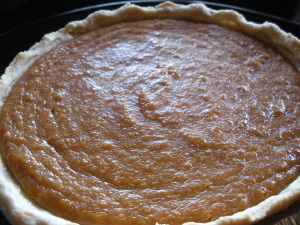 Yummy sweet potato pie with a homemade crust! Unbelievably good! Peel, cut and boil sweet potatoes. Whip potatoes using a food processor, hand mixer or potato masher. Add melted butter, sugar and seasonings. Mix to incorporate. Beat eggs and mix together with milk. Add to sweet potato filling and stir to incorporate. Add filling to food processor in batches and process each batch till smooth. Pour into prepared pie shells. If time is not on your side and you need a short cut, use store bought pie shells. If you have the time, make your own pie crust. The recipe that follows is quick and easy! Mix dry ingredients together in a bowl. Add fat with a pastry cutter or two butter knives. Slowly add cold water just to form a ball. Mix just to combine and dough holds together. Sprinkle with a little flour if sticky to make dough easier to handle. Divide dough into two balls and refrigerate to chill and rest dough. Roll dough out to no more than ¼" thick. Place into 9" pie pan/s and flute edges. Chill dough one last time. Pour sweet potato pie filling into chilled pie shell (deep dish or regular pie pan). Bake at 350 for 45 minutes, until center is set and toothpick comes out clean. If you have never tried a sweet potato pie before, place this on you baking list before the holiday season is over- you will be glad you did!